The fertile countryside of Italy's heel, Puglia is largely flat and characterised by olive trees with huge, gnarled trunks (some of them many centuries old), rich red soil, fields planted with tomatoes and artichokes, dry stone walls and a sense of endless space and far-reaching horizons. Our pick of the best places to stay in Puglia will enable you to explore this charming region from an equally charming property, whatever your budget! 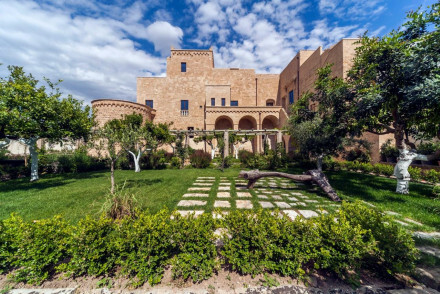 The best hotels in Puglia are dominated by the masserias, dozens of which have opened their doors to guests in recent years. These traditional fortified farmhouses are characterised by a tall, solid, square central block and a series of outbuildings often enclosed within high walls. Some of them have aristocratic origins while others were quite humble dwellings. 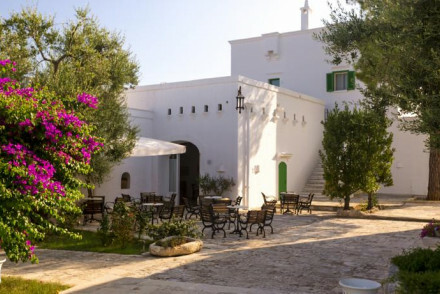 Today's masseria hotels range accordingly from five-star places with swanky spas, gourmet restaurants and endless services and facilities to relatively modest guesthouses offering a back to nature experience and homely food. Prices vary accordingly. Where to Stay - which town/area? Being long and narrow, nowhere is too far from the sea, and if you choose to stay in a location somewhere in the middle of the Salento peninsula, you can reach the splendid beaches of both the Adriatic and the Ionian coasts, as well as the area's historic towns, within a matter of about 20 minutes. Fasano is a prime example of a little known inland town, with its own little beach offshoot at Savelletri (just over 7km away). The region is dotted with fascinating towns and villages which offer a great deal to see and also make good bases for exploring further afield in the area. They are a great source of wide ranging accommodation including some of the best places to stay in Puglia. Highlights include glorious Baroque Lecce (known as the 'Florence of the South'), Martina Franca, Ostuni, Alberobello (renowned for its trulli), Nardo, Locorotondo, Otranto, Gallipoli, Trani, Polignano a Mare and Galatina. Even if we don't list a hotel in these places, there is never one too far away. For those who prefer to self cater we recommend our online partner, booking.com, who offer a wide range from apartments to country houses. Castel del Monte, a 13th-century citadel and castle, enjoys a hilltop location in Andria. Wander around this historic sight and be sure to learn all about the Castel del Monten wine that's produced in the area around the castle. Fasano's Zoosafari Fasanolandia boasts a drive-through safari park, a great day out for the entire family. What's more, it includes the only male African elephant in Italy! The baroque 17th-century Basilica di Santa Croce, situated in Lecce, is a beautiful spot to visit. Wander around taking in both the exquisite façade and breathtaking interiors. Gargano National Park in Foggia is a splendid spot to visit. Head off on long hikes up Mount Gargano or head along the coast and marvel at the brilliantly blue sea! But don't forget that this region of Italy is becoming more and more popular, so if you want to be sure of a bed in one of the best places to stay in Puglia, get organised and book well ahead. 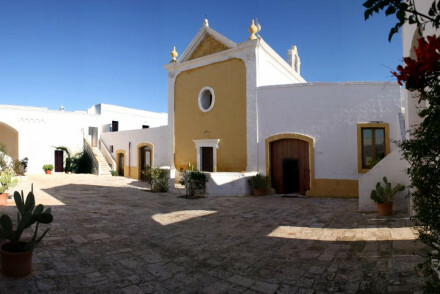 Masseria Salinola is a renovated 16th century property turned boutique hotel just outside Ostuni. Come here for rustic chic interiors and wonderful food. 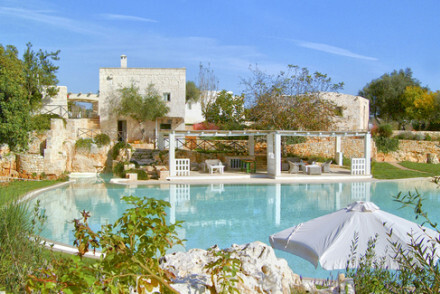 Have a look at the seriously swanky Masseria San Domenico with it's spa, glass-roofed pool and immaculate golf course. Some rooms even have private gardens. The Masseria Torre Maizza is a properly hip hotel with a cushion-scattered roof terrace, smart modern bedrooms, some with open fires and jacuzzis, a cave-like candlelit bar and private beach club. Or for something a little less expensive what about Masseria Don Cirillo a Masseria in a beautiful walled garden close to the Ionian coast? Decoration is ethnic, with killims, whitewashed walls and bare stone vaulted ceilings. 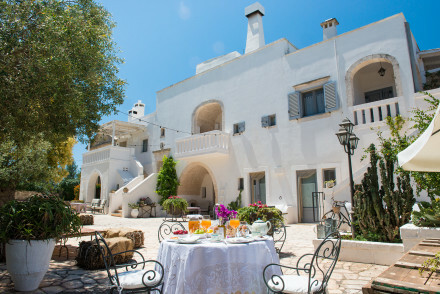 La Sommità Relais Culti in the so-called 'white town' of Ostuni. There are terraces and ramparts to sit on and the decor is pared-back and calming. 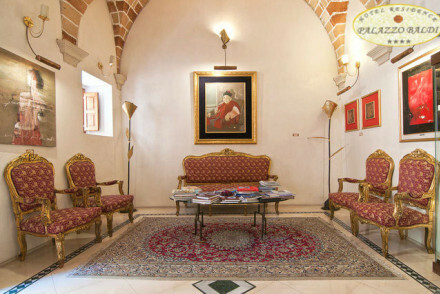 Or book the chic Corte Palmieri in the seaside town of Gallipoli where a warren of arched passages and staircases leads to the stylish beamed rooms and breakfasting terrace. 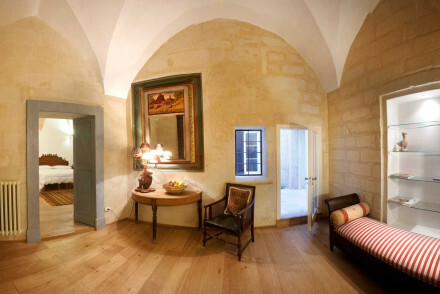 For great value and charming simplicity the Palazzo Personè in Lecce, with its cellar restaurant/wine bar and spartan rooms with bare stone floors, is ideal. The gorgeous Relais Il Mignano is a wonderful city stay, perfect for exploring Nardò. The property boasts ornate historic exteriors that ooze charm as well as elegantly traditional accommodation. Splendid value! Palazoo Mosco Inn offers cute, romantic rooms with private balconies and some even boast four poster beds. Relax on the rooftop terrace and take in the magnificent views over the marina. Understated but charming. For a more rustic experience, Masseria Li Foggi is a fantastically romantic stay located just outside Gallipoli. Offering whitewashed rooms with plenty of natural light, there's also a lovely outdoor pool to relax next to as you spend your days sunbathing. Surrounded by olive trees and lovely scenery, Masseria Panareo is the perfect option for rural romance. Chic accommodation dotted around the garden and lovely Italian meals served up at the restaurant. Close to both the coast and a number of beautiful nearby towns. 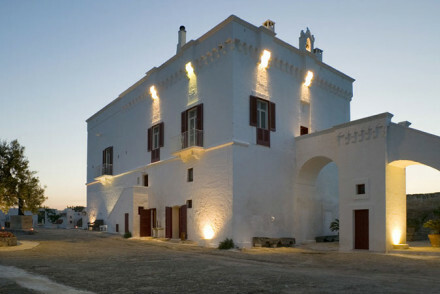 Palazzo Guglielmo is located in a small town by the Salentine Coast. It offers a range of smart accommodation featuring plenty of light hues, as well as lush gardens and a private pool. Quiet and serene. 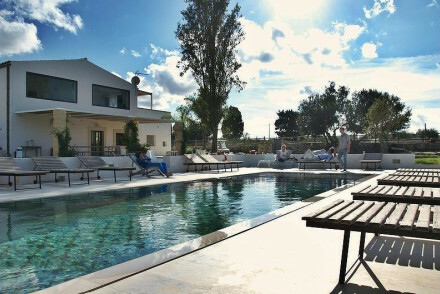 I Luoghi Di Pitti is set in a picturesque farmhouse in the countryside of Alta Murgia. Enjoy atmospheric meals in the hotel's wine cellars and stay in tasteful accommodation featuring smatterings of modern art. Palazzo Del Corso is a 5* spot located on Gallipoli's peninsula. Enjoy elegant, traditional interiors with four-poster beds and balconies. Magnificent views from the rooftop terrace and an excellent seafood restaurant. Casa Pasca boasts a quiet atmosphere and a hot tub to unwind in! Spend your days sunbathing on the rooftop terrace with some wine from their cellar and feel a million miles away from all your worries. Relais Villa San Martino is a 5* country villa located in a top spot outside the town of Martina Franca. This gorgeous peach-hued villa is set in lovely gardens and provides suites featuring elegant pastels with antique furniture. Relax in the spa to fully unwind. Canne Bianche enjoys a superb coastal location with its own private beach area. This lovely spot offers boutique accommodation as well as a spa, jacuzzi, sauna and Turkish baths on site. Lama Di Luna Biomasseria is a truly unique spot, a Feng-Shui farmhouse which dates back to the 1800s. Located in a serene rural spot, spend your days relaxing in a hammock by the pool or treat yourself to a massage! Located amidst an organic fig orchard, Furnirussi Tenuta offers unfussy contemporary accommodation and a large outdoor pool. With a sleepy setting and spa facilities to boot, this is a top spot if you're looking for a rural retreat. B&B Fascino Antico is a tremendous value option. Offering characterful white domed rooms with rustic interiors, there's also a lovely garden and pool to relax by. With 3 of the rooms able to sleep up to four people, it's a great choice for families. 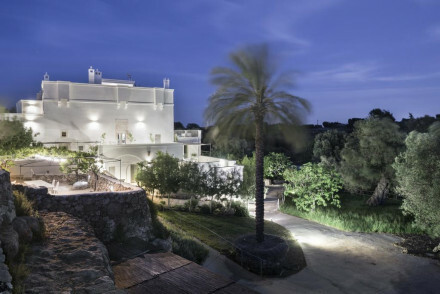 Masseria Alchimia offers ultra modern suites sleeping between 3 and 5 people, complete with private kitchens and terraces. Read a book in the garden as you soak up the sun or head down to the beach, just a short distance away. L'Orangerie D'Epoque is a delightful B&B offering three bedrooms as well as a four-person suite. 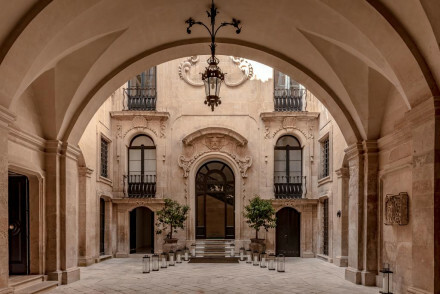 Housed in a historic palazzo and surrounded by Lecce's baroque architecture, this is an ideal spot for family city breaks. La Riviera boasts a superb coastal location, right on the waterfront. Some suites accommodate up to four people and it's situated just a short distance from Gallipoli's sights. A great value traditional townhouse. Borgo San Marco is situated on an historic olive-growing estate and features rustic interiors. With interconnected rooms, self catering accommodation and babysitting services offered, it's the ultimate family spot. For larger groups and families, the best option is often to book a holiday home or apartment. For a comprehensive range from budget to boutique, we recommend you visit our online partner, booking.com. You can fly to both Bari Airport (9km west of the city) and Brindisi Airport (4km north of the city). Alitalia serves both of these airports, whilst British Airways flies from Gatwick to Bari and Ryanair flies to Brindisi. With the average temperature around 24°C in July and August, this is the best time weather-wise to visit Puglia. June is the driest month, and the amount of rainfall slowly increases as the summer goes on. That said, October can still be warm enough with temperatures up to 21°C and far fewer tourists around! 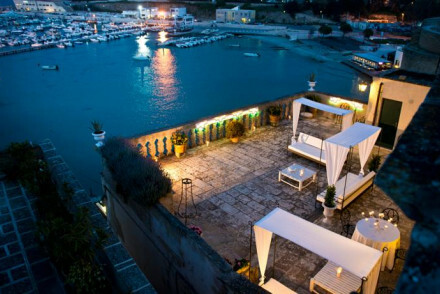 Browse through our list of all the best places to stay in Puglia and start to plan your stay. Widen the net and include neigbouring Basilicata or Calabria. Or, feel free to call or email a friendly guru for advice. A charming bed and breakfast boasting an enviable central location and epic vantage from its cliff top position. Small but perfectly formed rooms are traditional in style with exposed stone walls and antique furniture. Ideally located for exploring the city's sights and reasonably priced too. 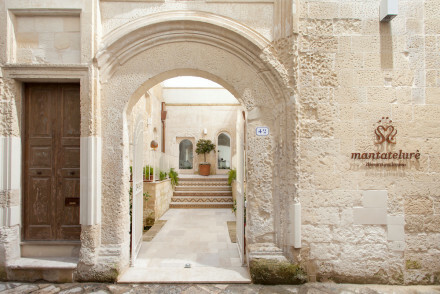 Local exploring - Situated in the heart of Puglia and within walking distance of many of the main tourist attractions. Sights nearby - Visit the mosaic floor of the 'tree of life' at the 12th century Cathedral, Otranto. 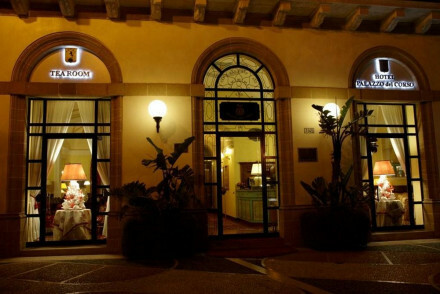 Cooking classes - Learn to cook Apulian dishes at the hotel's cookery school. Sailing - Rent a boat and explore the picturesque coastline. Characterful B&B. Unique rooms have tiled floors, traditional fabrics and antique furniture. There is a charming breakfast room, lounge room and rooftop garden terrace. Ivy clad facade, a very welcoming stay at excellent value. 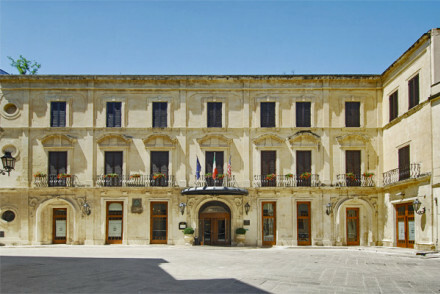 A 16th century palace situated in the heart of Nardò. Stunningly renovated rooms keep their original charm with exposed stone, beamed ceilings and antique furniture. The simple design throughout gives a contemporary air. A rooftop terrace and hot tub are ideal for unwinding with a drink. City chic. Local exploring - Set within the heart of the historic centre and with many of the city's attractions within close proximity. Value chic - A luxury property with exceptionally good rates. Great walks - Just a 10 minute drive from the Portoselvaggio Nature Park where one can set out on gorgeous coastal walks. Sights nearby - Make a trip to the historical town of Lecce. 1/2 an hour away. 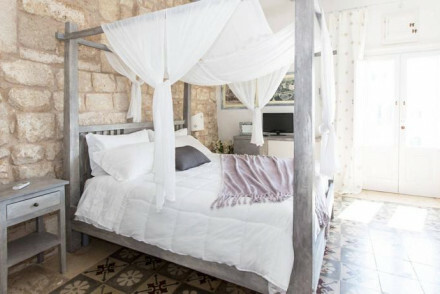 Located in an old 16th-century Synagogue, this charming B&B has bedrooms with original stone walls, high ceilings and calming natural colours. Palazzo Personè also boasts an extraordinary Baroque facade, cafe and cellar restaurant with wine bar. A great spot for exploring this ancient city. Swimming Pool - Pool and wellness lounge. Excellent value B&B in the centre of Galatina. A lovely yellow townhouse building with traditional rooms and suites. Vaulted meeting rooms, breakfast room, and art room. 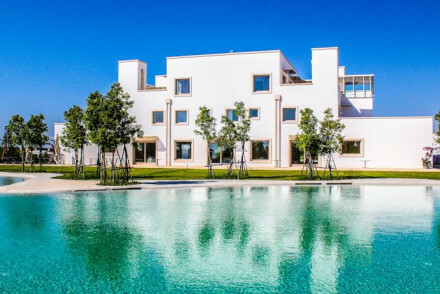 Ultra modern collection of ten studios in rural Puglia. White washed studios sleep between 3 and 5, all with kitchens and private terraces. 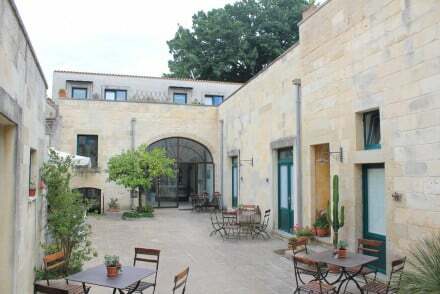 A surprising collection in a former convent, ideal for families, groups and couples. 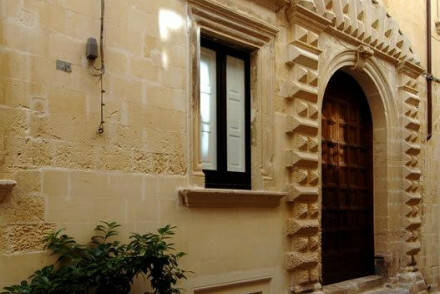 Graceful B&B near Sant'Oronzo Square in the centre of Lecce. Huge, light-filled bedrooms with sandstone walls, parquet floors, and elegant furniture. A great value spot, and family friendly too. An old family home, steeped in history overlooking the charming port. Elegant white interiors with lovely sea views. A pleasant terrace with comfortable seating and shady umbrellas. A romantic little spot to enjoy the beach and close to the sights. A relaxed and calming home. Casa Pasca B&B offers two spacious and elegant rooms in the town of Cocumola, a few miles from the Adriatic coast. Begin the day with a delicious breakfast before sunbathing on the rooftop terrace with some wine from their extremely well-stocked cellar. An unfussy but charming stay! Contemporary hotel in former tannery. Large rooms have exposed bricks walls, furnishings in cream and white, modern bathrooms and artworks. Sunny outdoor terrace to enjoy breakfast. Short walk from city's sights. Chic, elegant and grown-up. Sights nearby - Maglie Duomo, Palazzo Baronale Capece, and Madonna Addolorata Church. 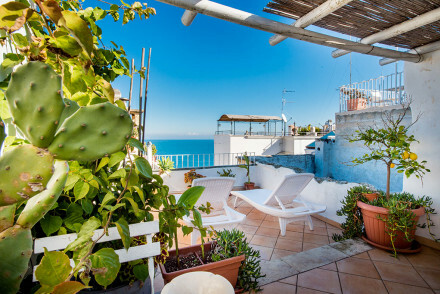 A charming little B&B in the picturesque fishing town of Polignano a Mare. The rooms are simply furnished and feature exposed brick walls and wooden ceilings. Explore the charming streets of the town or wander down to the beach. A great value option. 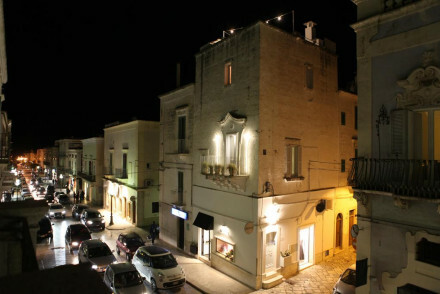 Local exploring - A cosy B&B set within the ancient walls of Polignano a Mare, just a minute from the beach. Sights nearby - Guests must be sure to check out the incredible Castellana Caves. A charming 17th century Trulli set amidst pretty grounds. 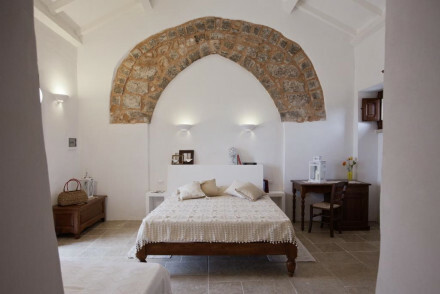 Sympathetically converted rooms features arches, domed ceilings, white washed stone walls and simple traditional furnishings. A glorious spa, outdoor pool and locally acclaimed restaurant. A great choice for a traditional Puglian experience. 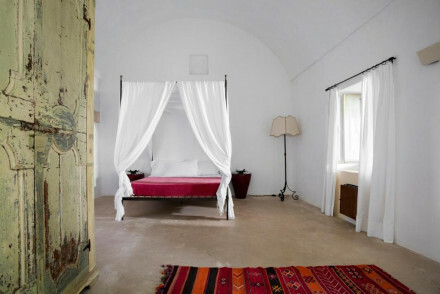 Hideaway - Get away from it all amidst walnut and fig trees, wisteria and jasmine - a stunning traditional Puglia domed truilli. Foodies - A restaurant hugely popular with locals for the excellent antipasti. Sights nearby - Just 9kms from the impressive caves of Castellana. A charming little boutique hotel with views of the marina. Romantic rooms and suites have mosaic floors, iron bedsteads, some four poster beds, fresh creamy cottons, and private balconies. 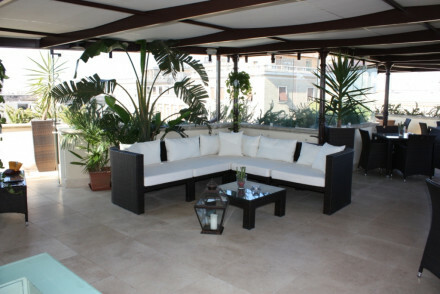 Lovely roof top terrace, bar and sitting room area. Understated charm but oh so chic. Views - Stunning views over the marina from the roof top terrace. Romantic Break - Understated romance in chic accommodation. Sights nearby - Gallipoli Port, Gallipoli Castle and Greek Fountain. 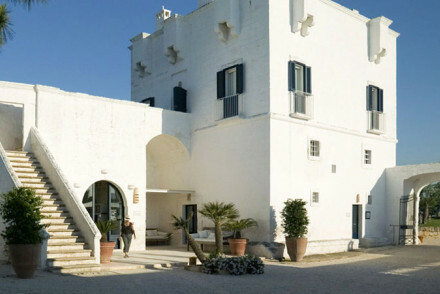 Just a short walk from the beach, Masseria Cisternella is a stellar rural hotel on the coast of Puglia. Each individually decorated room carries its own charm and nods to the rich history of the farm. Superb value for money. Sights nearby - Visit the nearby Sant'Agata Cathedral. Three pretty bedrooms and a gorgeous garden in a family palazzo. Antique furniture, stone fireplaces and period vaulted ceilings - two bedrooms have kitchenettes and access to the garden. Plus there is a larger suite ideal for families. A great value choice. 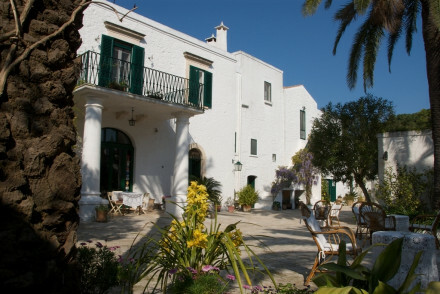 A family-run masseria packed full of character and history. Four atmospheric rooms feature family relics, period furniture and pretty shutters. Home-made breakfasts are a delight to awake to. Take a cooking class, explore the picturesque countryside or simply curl up with a book. Rural bliss. Country Escape - A traditional country manor set in picturesque countryside. Unwind and live the Puglian dream. Great walks - Head out from the hotel in any direction and find stunning countryside and excellent walking. Cooking classes - Learn to cook traditional regional cuisine in the hotel's cooking classes. 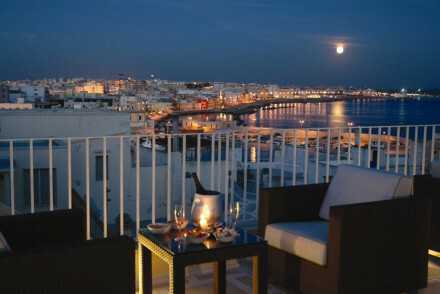 Elegant luxury hotel, which boasts a stunning roof top solarium with panoramic views of the sea, and hot tub. Contemporary rooms feature wooden floors, crisp linen, and striking lamps. Just a five minute walk from the centre of town and easy access to local beaches. A chic, romantic choice. Trulli e Puglia offers enchantingly unique accommodation, with suites and bedrooms set in charming conical stone houses (all UNESCO protected.) A cafe and wine bar are open to guests, as well as a small shop selling Puglia products. Traditional Italian charm. Stylish farmhouse conversion surrounded by olive trees and stunning scenery. Rooms are dotted round the grounds & offer classic country style with vaulted stone ceilings and four poster beds. The restaurant serves Italian dishes on the outdoor terrace. Perfect for both beaches & sightseeing. Traditional comforts and great hospitality in the heart of town. 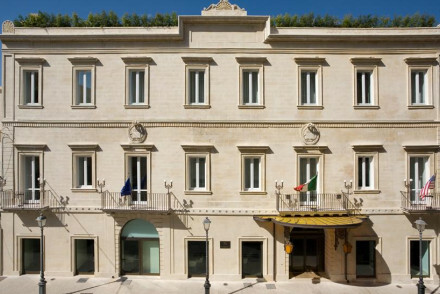 Behind the lovely Lecce stone facade the bedrooms contain frescoes, stucco work, cherry wood furniture and rich fabrics. 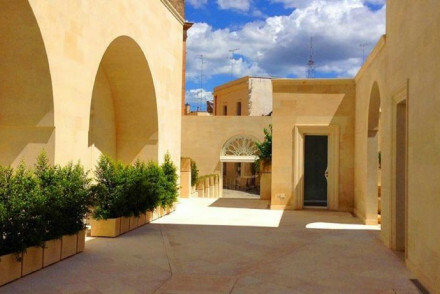 A lovely little restaurant, small spa and gorgeous roof top terrace with views of Lecce. 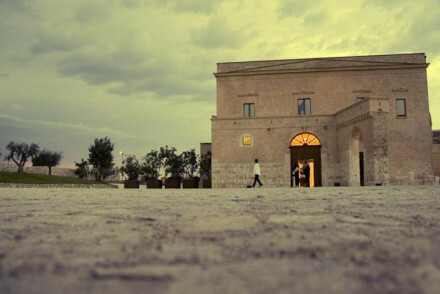 A small hotel in a historic building in the heart of Gallipoli. Individually styled rooms benefit from enormous sash windows, high ceilings, simple contemporary furniture and crisp white linen. A sunny terrace is a quiet spot to enjoy breakfast before spending a day exploring the vibrant city. Local exploring - Perfectly located in the heart of historical Gallipoli with easy access to the beach and many of the city's main attractions. Sailing - Take a day boat trip from Gallipoli to the nearby Punta della Suina, Porto Selvaggio or Isola di Sant’Andrea. Sights nearby - Visit the Cathedral dedicated to St. Agatha, the finest example of the Salentine Baroque in Gallipoli. Seamlessly chic hotel in a small town near the Salentine Coast. Lush gardens surround a pool, a relaxing roof terrace looks out over sandstone rooftops, all-cream rooms and suites have private terraces and hot tubs. Perfect for families, couples, or groups. 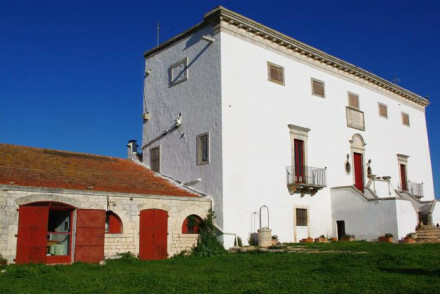 A peaceful, picturesque farmhouse set in the scenic rolling landscape of Alta Murgia. The renovated 16th century farmhouse's rooms are modern and minimalist, decorated with tasteful contemporary art. Enjoy a sumptuous evening meal in the hotel's wine caves. A romantic rural hideaway. Sights nearby - The historic Matera is 15 miles away with its unique UNESCO Sassi (town centre). Great walks - Enjoy beautiful walks around the rolling countryside of Alta Murgia. Elegant hotel in city centre. Rooms feature wooden floors, creamy fabrics and big marble bathrooms. Roof terrace, gym and bar. Minutes from historical city sights; ideal for exploring as a city break. Five star country villa with great location for touring cultural sights and beaches. A peach-hued building surrounded by lovely gardens. Beautiful suites in elegant pastels with antique furniture. Excellent restaurant, spa and pool. 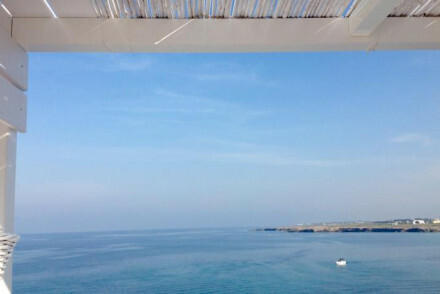 A spoiling spot to explore Puglia from. 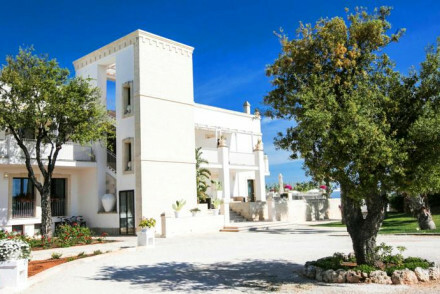 Local exploring - An elegant Villa, just outside Martina Franca and surrounded by protected areas, UNESCO sites and unique Baroque architecture. Total relaxation - Comfortable suites, with flower filled terraces, swimming pool, pampering spa and beautiful parklands. Great walks - Wander the expansive parklands that surround the villa, or head further afield and explore the olive groves. Sights nearby - Make a trip to the UNESCO-protected Trulli of Alberobello and the Baroque Martine Franca. 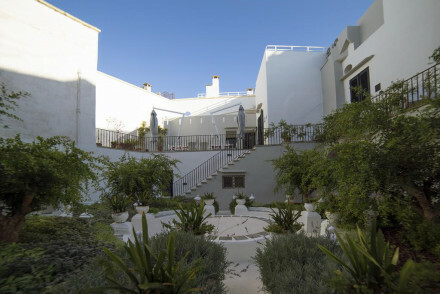 18th century villa turned boutique hotel. A private, exclusive property offering accommodation for up to 8 people and priding itself on attentive service. 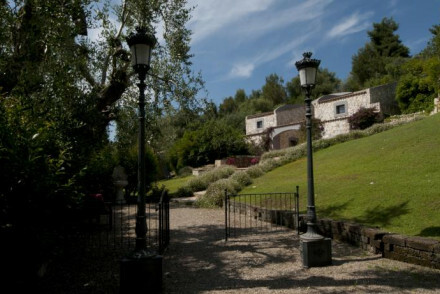 The elegant villa sits in ancient olive and almond groves. The perfect romantic hideaway with easy access to the beach and local exploring. Romantic Break - A blissful romantic hideaway with flower filled gardens, Romanesque saltwater pool and massages in the ancient temple. Eco break - Eco-sustainability is at the heart of this resort, they recycle water, use solar power and only organic produce. Sights nearby - Visit the caves at Castellana Grotte or any one of the stunning and unique historic towns in the surrounding area. Cooking classes - Pizza making evenings and cookery courses are available on site, and they're free with bookings of 4+ nights. Waterfront location and historic setting with good value rates. A great choice for families or groups on a budget. Beautiful townhouse with private balconies overlooking the seafront and small beach. Public spaces are decorated with beautiful murals, painted ceilings, chandeliers and antiques. Families - Some suites sleep 4. A beautiful relaxing hotel on the beach offers rooms with private balconies and spectacular views of the Adriatic. Interiors are simple and stylish in neutral colours and antiques. 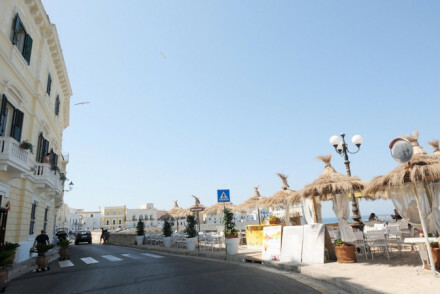 Timo, the in-house restaurant serves Puglian dishes including fresh seafood. A truly Mediterranean feel. Total relaxation - There is a spa, pool, jacuzzi, Turkish baths and sauna on site - divine! A delightful rural hotel set in picturesque traditional south-Italian Trulli. Rooms exude a rustic charm and are elegantly decorated with simple furniture. 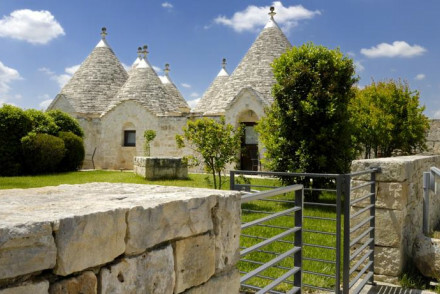 Take an excursion to discover the marvellous Trulli of Alberobello or simply enjoy the beautiful scenery by the pool. A Puglian paradise. Country Escape - A wonderfully rustic chic country retreat, feast on fresh traditional Pugliese dishes and local wines in the fragrant gardens. Sights nearby - The beautiful Trullo Church of St. Anthony is five miles away as well as the UNESCO protected Trulli of Alberobello. Great walks - Enjoy beautiful walks in the surrounding countryside of Puglia. 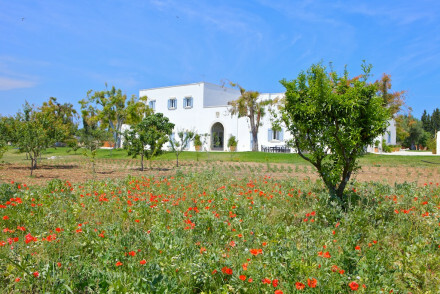 Laid back brick masseria in a beautiful walled garden close to the sea. Rooms with an ethnic slant - killims, colourful bedspreads, white washed walls and stone vaulted ceilings. A lovely shady pool and lounge area. A great beach spot. 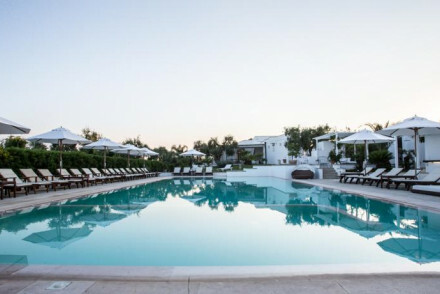 Total relaxation - Unwind in style in this charming Masseria with lush gardens, lovely pool, and luxurious suites with private terraces. Country Escape - Bask by the crystal clear waters of the Ionian sea or grab a bike and explore the stunning Apulian countryside. Sights nearby - Explore the fascinating and historic UNESCO heritage city of Gallipoli. A romantic, stylish and refined hotel that features modern comforts and excellent personal service. Beautiful airy bedrooms in whites and pastels with ethereal drapes. Wonderful restaurant, roof top terrace and private beach just a few kilometeres away. The perfect romantic getaway. Romantic Break - A romantic boutique in the White City of Ostuni, boasting chic piano bar, spa, hot tub, Hammam and elegant Italian cuisine. Great walks - A 15 minute drive brings you to the beautiful sandy beaches of Pugila. Sights nearby - Visit the nearby cathedral, built in late gothic style. Serenity pervades throughout the lovely Tenuta Centoporte, just outside Otranto. All components come together to create a harmonious atmosphere, with stylish rooms, a heavenly outdoor pool and deliciously prepared meals from the Salento region. Perfect for a relaxing romantic break. Romantic Break - The elegant, intimate rooms coupled with great restaurant and lovely gardens make it the perfect spot for a romantic break. Local exploring - A relaxing haven set amidst rolling olive groves, head off on a bike and explore the Salento region. Sights nearby - Culture vultures must visit the nearby Castello di Otranto to learn about the areas history. Great walks - There are plenty of beautiful walks through the surrounding olive groves. A rustic chic country house just outside Gallipoli. Fabulous rooms and apartments have white washed walls, private shady terraces, lots of natural light, and kitchens. Pool, lovely garden strewn with olive trees, bikes to rent, and boats to borrow from the marina. Excellent value, family friendly. Families - Beautiful self-catering apartments sleep four each. Beach Life - The beautiful Ionian coast of Salento to explore. Value chic - Fabulous value. 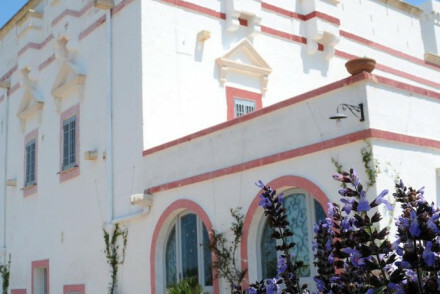 Gorgeous suites within 14th century building overlooking the sea. Creamy stone walls are complimented by white furnishings in the guestrooms, with marble bathrooms sinks and soft lighting. Each suite has a private spa pool, and breakfast is served on the sunny terrace. Romantic and peaceful. 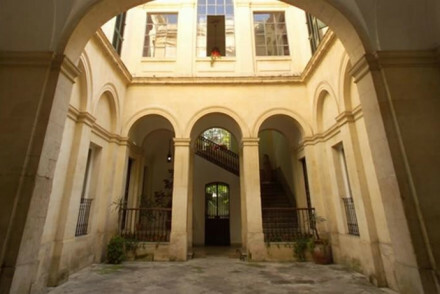 Refined sixteenth century mansion in a quiet corner of stunning Baroque Lecce with six modern, elegant rooms. Guests can enjoy a freshly baked Italian breakfast or sip glasses of prosecco in the exclusive garden terrace beneath the citrus trees, or relax in the hot tub. The perfect romantic getaway. Local markets - Explore local coffee shops and street markets. 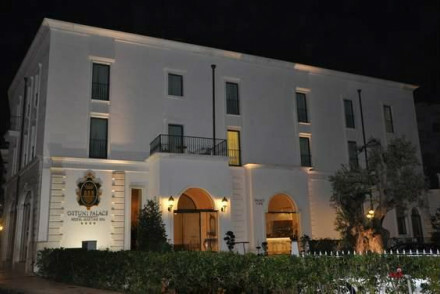 A fabulous Five Star hotel on Gallipoli's peninsula. Stunning sea views from the roof top terrace, lively bar, excellent seafood restaurant, and a top of the range wellness centre. Rooms and suites filled with romance have four poster beds, creamy furnishings, and balconies. Luxurious on all fronts. Roof terrace - Watch the sun set from the roof top terrace bar, pool, or restaurant. Views - Stunning seaviews from the hotel's peninsula position. Foodies - Fabulous seafood restaurant La Dolce Vita. High-tech luxury and stylish contemporary design in a lovely old building. The five-star hotel combines earthy hues and local materials with sleek modernism. Elegant roof top restaurant serves local dishes, and has great city views. Spa and meeting facilities. City style for the mainstream. 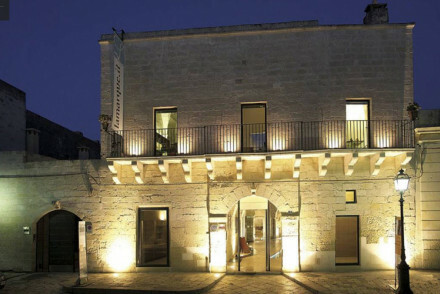 City Style - A chic hotel with panoramic rooftop views of Lecce’s Baroque historic centre. Minimalist luxury in an ancient white town. Stunning views from the terraces and a lovely restaurant serving fantastic food with immaculate presentation. Large comfortable beds in airy bedrooms. A small plunge pool perfect for cooling off. A gem of a hotel. Foodies - A fantastic little restaurant with Michelin Starred chef and great wine list. Cooking classes - Cookery classes on offer at the hotel. 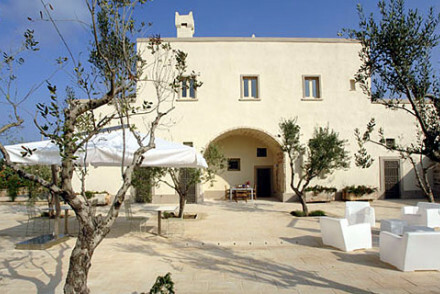 Simple yet stylish masseria on historic olive-growing estate. An ochre painted farmhouse with delightfully rustic rooms - bare stone, wood, wrought iron and earthy tones. The restaurant serves local produce and within the walled gardens sit citrus groves, a pool, hot tub and shady terraces. Families - A fantastic spot for families with interconnecting rooms, self catering, pool, playground, high chairs and babysitting. Value chic - A chic and unpretentious masseria, with elegant rooms, glorious pool, citrus garden and bourainvillea gardens. Local markets - Head into Fasano for their buzzy Wednesday market and pick up some great local produce. Cooking classes - The hotel organises cookery classes, learn to whip up your favourite regional dishes. 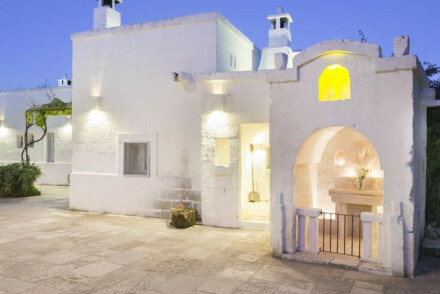 Gorgeous traditional Ostuni farmhouse. Traditional trulli (conical peasants' houses) act as rooms and suites, immaculately painted in white. Stunning grounds, terraces, and enormous swimming pool. A fabulous choice for romantic breaks, family holidays, and friends. A farmhouse hideaway, surrounded by lovely gardens, between Savelletri and Fasano. Rooms are elegant and spacious offering large private terraces with views of the sea. The restaurant serves traditional Apulian cuisine and there's a bar by the infinity pool. Rustic-chic 4 star luxury. Families - Large triple rooms available to accommodate families, plus the kids will love the pool and garden. Country Escape - Set in a quiet and peaceful location, a perfect escape from the city for a few days. Active Holiday - Offers several activities around the countryside like biking, hiking and riding. 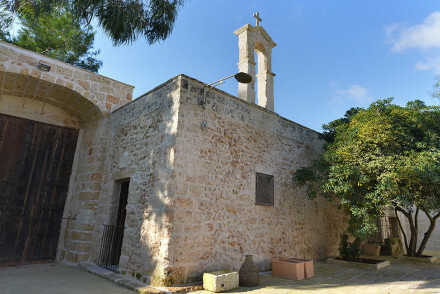 Sights nearby - History buffs should visit the nearby Trullo Church of St. Anthony. Sprawling hillside hotel with views of the sea below. Traditional stone buildings house simply decorated rooms and family suites. 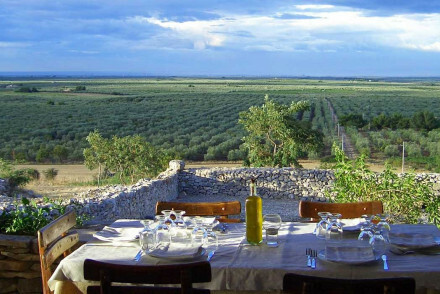 Terraces overlook olive groves and the restaurant serves delicious local cuisine. An undiscovered gem, very family friendly. Lama Di Luna Biomasseria is a unique Feng-Shui farmhouse dating back to the 1800s. Original stone walls and spacious suites in a tranquil and secluded spot. Unwind in a hammock by the pool or enjoy a BBQ! Lovely cuisine served at their restaurant using local produce. A peaceful and romantic stay. Total relaxation - Days spent lounging by the pool, gorgeous views and a tranquil atmosphere-what more could you ask for? Luxury farmhouse with immaculate suites. 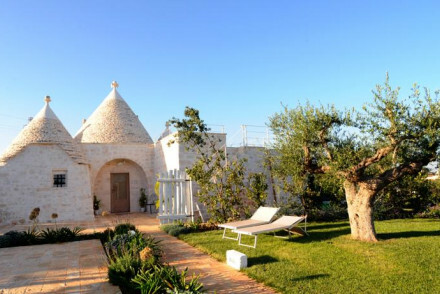 Rustic chic trulli, some with private terraces and mezzanine levels. White on white, stone on wood, olive and chestnut trees, fireplaces, and modern gadgetry. Delicious food and a lovely pool. Great walks - Nature trails for walking and jogging. A luxurious masseria set in glorious Puglian countryside. 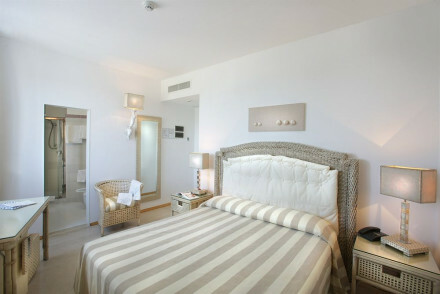 Rooms are chic and contemporary with crisp white linen, exposed stone, white washed walls and luxurious bathrooms. Expect fabulous wines, an abundance of outdoor pursuits (for those who choose) and plenty of quiet spots to simply unwind. Country Escape - A beautiful masseria offering both luxury and remoteness in a glorious part of rural Italy. Cooking classes - Learn to make Apulian dishes in the cookery school. Sailing - Spend a whole day aboard a luxurious yacht. 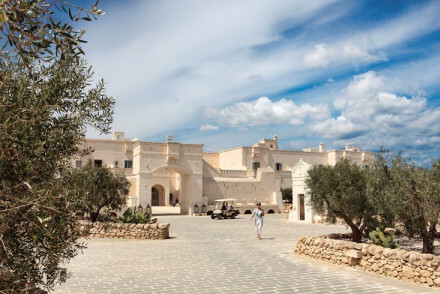 A luxurious and stunning village-style resort in Puglia. Rooms and suites, the ultimate in opulence, have creams, marbles and chic accessories, all with enormous bathrooms. Gourmet Pugliese cuisine, pools, spa, beach club, tennis and gardens. Luxury, gourmet and romantic. A collection of white washed trulli cones sitting pretty against a Puglian hill. Designed impeccably throughout with the soft yellow stone set against beige and white hues and the odd pop of colour coming from a contemporary chair or painted window frame. A tranquil and romantic hideaway. Hideaway - A charming Puglian retreat designed to completely unwind. Great walks - Discover the beautiful countryside on long walks starting straight from the property. Sights nearby - Visit the architecturally unusual cathedral in Trani. A five star family-run hotel with a delightful down-to-earth atmosphere. Renovated 16th century farmhouse with sprawling Moorish outbuildings and flower-filled courtyards, terraces, big pool and tennis courts. Charming rooms in florals, tiled floors and fireplaces. Excellent spa and beach club too. Beach Life - This chic hotel offers access to their own private beach with white sands and blue waters and a seafood restaurant and bar. Spa breaks - Refresh and revive with the spa's extensive therapy list, sauna, frigidarium, turkish bath and hammam. 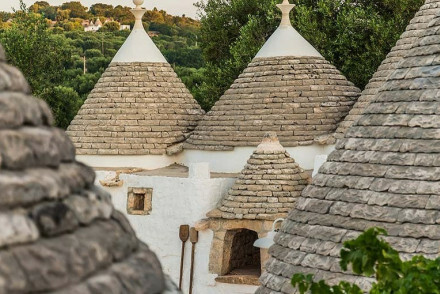 Sights nearby - Make a trip to the UNESCO-protected Trulli of Alberobello. Rustic-chic and a laid-back atmosphere on an 18-hole golf course. Rough white walls, grey paintwork and candlelit rooms adorn this former Roman villa. Breakfast and superb set dinners are served on a covered terrace. A great choice for those who want understated luxury. Total relaxation - Completely unwind at this rustic chic family run property offering pool, gardens and views of the sea- perfection. Active Holiday - Whether playing golf, swimming in the sea or cycling is you're thing there's plenty to keep you active and alert. Sights nearby - Check out the fascinating Gnatia archaeological ruins, right beside the hotel. Great walks - Wander down to the coast and explore the beaches on foot. 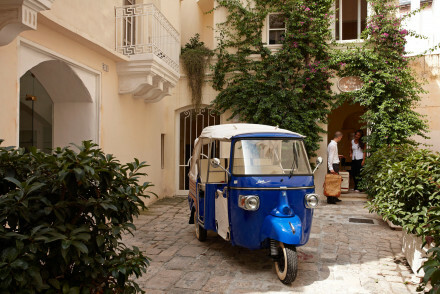 Justly famous masseria with wonderful food and a vaguely eccentric air. Pretty bedrooms with white washed walls surround a bougainvillea-filled courtyard. Organic produce from the farm and olive grove is used in fabulous multi-course meals. A divine gourmet rustic retreat close to the beach. Foodies - Members of the slow food movement the kitchen, under Rosalba, create extraordianry cuisine from simple home grown ingrediants. Romantic Break - Chic rooms with wisteria swathed stairways, enchanting interiors and antique furnishings are the epitome of fairytale romance. Great walks - Meander through olive trees on walking trials from the hotel. A charming one bedroom apartment in lovely Fasano. Domed ceilings, white washed walls off set by contemporary furniture. A large roof terrace to sip a cocktail on and a contemporary kitchen to whip up an Italian feast. Steps from the cafes and shops. An oh-so chic way to experience Italy. Local exploring - Live like a local in this stylish apartment just steps from Fasano's cafes and shops. Great walks - Wander the pretty streets and admire the quaint white-washed houses, churches, palaces, squares and towers. Sights nearby - Visit the ruins of the Roman town of Fasano Egnazia on the coast. 5* resort in hills overlooking the Adriatic sea. Large contemporary rooms have wooden floors, white furniture and splendid bathrooms. Outdoor and indoor pool, spa, sauna and hot tub. Excellent Apulian cuisine. Understated chic and great value. 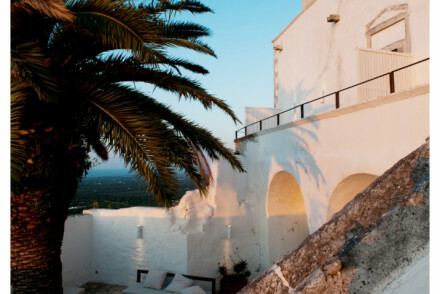 A chic converted Masseria set in the picturesque rural landscapes of Puglia. White washed rooms, uneven walls and well placed ornaments all lend an air of rural-cool. A good sized pool, fantastic restaurant (serving regional produce) and easy access to Puglia's sights make this a fantastic stay. 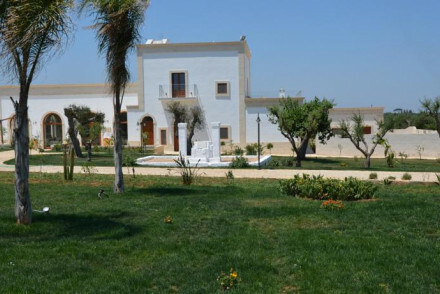 Country Escape - A converted farm set in picturesque Puglian countryside. 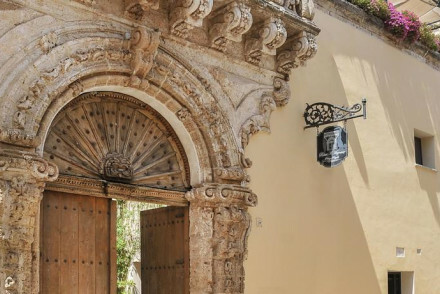 Sights nearby - Explore the churches and palaces of beautiful Lecce. A small corner of tranquility in central Lecce. Bearing distinctive local architecture, the hotel's minimalist aesthetic is complimented by pinnacled ceilings and tasteful modern art. 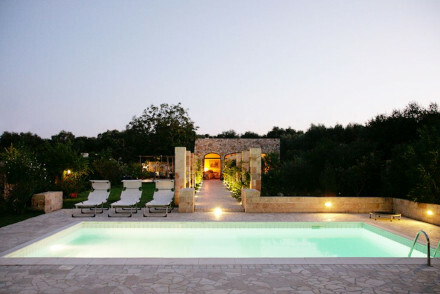 Relax by the swimming pool, surrounded by olive groves, and enjoy some delicious Pugliese cuisine. Sights nearby - Within five minutes walk of Basilica of Santa Croce, Roman Amphitheatre and Duomo Square. Local markets - Browse the local markets of Lecce. Relaxed retreat with a contemporary twist surrounded by olive trees, vines and date palms. Sophisticated, airy white on white rooms with cool flagstone floors, delicate wrought iron beds, Pugliese embroidery and Moroccan lamps. Lovely pool, local food and stunning surrounding farmland. Honeymoons - A tranquil and romantic spot for honeymooners, each of the elegant suites faces onto the gardens and the soothing countryside. Sights nearby - Explore the lovely Otranto, with its lively bars, restaurants and squat Aragonese castle. Cooking classes - The hotel organises cooking classes, learn to whip up your favourite dishes frm the menu. Great walks - Take a wander around the lush gardens, or further a field into this scenic landscape. Stylish rooms with sun-drenched terraces in a fascinating old building in the seaside town of Gallipoli. Arched passageways and courtyards lead to cool bedrooms with white washed walls, wooden beams and stone floors. Dine on the large roof terrace with stunning sea views. A relaxed beach style. Sailing - The hotel has a private yacht. 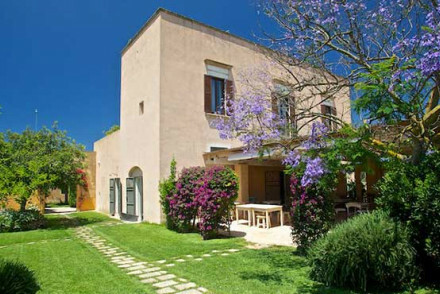 Contemporary design in an old shell within easy reach of charming Gallipoli and its lovely beaches. Original features compliment contemporary furniture and ethnic textiles. Lovely courtyard garden and swimming pool for relaxing in, and superb breakfasts and dinners on private patios. Local exploring - Ideally situated to explore the local historical towns and villages as well as the stunning Salento countryside. Beach Life - Just ten minutes from Porto Selvaggio Natural Park with one of the most beautiful beaches in Italy. Sailing - Yachting and sailing can be organised by the hotel, the perfect way to explore this magnificent coast. An elegantly restored historic fortified farmhouse, minutes from the sea. 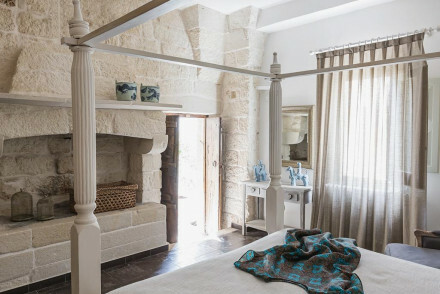 Wonderful rooms and suites with rough white washed walls, fine linens and silks - one suite occupies a cave and has its own olive grove and pool. Fabulous regional cuisine, Aveda spa and its very own private beach club. Active Holiday - Explore the rugged countryside on the hotel mountain bikes, head down to the beach, or grab a round of golf. Sights nearby - Head to the nearby Mozzarella Palace for a cheese tasting then down to the local fishing village of Savelletri for seafood. The stunning Furnirussi Tenuta is set in an organic fig orchard in sleepy Carpignano Salentino. The property boasts boutique, contemporary accommodation as well as a superb outdoor pool-perfect for a refreshing dip! Great cuisine at 'Il Ficheto' restaurant. An upmarket country retreat! Foodies - Fantastic food- with a most of the veggies coming straight from the farm and a focus on fresh and seasonal produce. Total relaxation - A spa, gorgeous cuisine and beautiful countryside; the perfect mix for completely unwinding. Families - With plenty of space for the kids to run around, and a pampering spa for mum and dad! Great walks - Wander through the picturesque fig farm admiring the views and sampling the produce! Situated amid beautiful countryside, this resort is perfect for a relaxing getaway. Rooms are decorated in traditional style: creams and whites with splashes of colour, most with a furnished balcony to soak up the views. Traditional and delicious Puglian cuisine. Romantic, luxurious and spoiling. A simply gorgeous rural property set in picturesque countryside surrounded by olive groves. Rustic chic throughout with uneven white washed walls and exposed beams. Whimsical rooms are full of character with exposed stone, floating white linen curtains and antiques. Rural Italy at its best. Country Escape - A picture perfect country house with rustic chic interiors, surrounded by olive groves. Great walks - Go for long walks through the picturesque groves. Sophisticated, contemporary hotel with a young, hip vibe. Smart blue and white contemporary bedrooms, some with open fires and jacuzzis. Wonderful courtyard bar with Balinese sofas and excellent restaurant overlooking the pool. Small spa, golf course and private beach club. Country Escape - Surrounded by ancient olive groves and fruit orchards, with fantastic walking, produce straight from the farm, and beach club. Romantic Break - A grown up choice with luxorious rooms, wonderful food, romantic yacht trips, olive oil massages and picturesque scenery. Great walks - Explore trulli country on foot or by bike- discover it's ancient olive groves, fruit trees and miles of scrub. Cooking classes - Pick fresh olives and vegetables from the olive groves and use them in yummy Apulian dishes. A chic family-run farmhouse in stunning rural Puglia. White on white rooms feature decorative touches: antique headboards and hanging bridles. The furnishings are also divine. While away days besides the glorious pool and dine on sumptuous regional cuisine. The ideal spot for a relaxed rural escape. Country Escape - A chic working farmhouse perfect for indulgent holidays taken at a slow pace. Great walks - Take long walks through the surrounding forest. Don Totu offers elegant boutique B&B accommodation in San Cassiano. 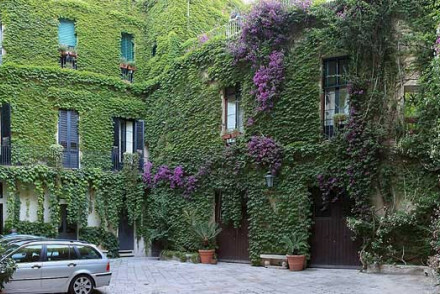 This elegant 18th-century palazzo comes with a lovely luscious garden. Bask in the sun by the pool and enjoy a cocktail or homemade ice cream. Head off by bike or foot on a tour of the area. A rejuvenating stay! A seriously stylish conversion of an ancient fort overlooking the Adriatic. Individually designed rooms have travertine vaulted ceilings, and elegant furnishings. There's a little rooftop plunge pool for cooling off & a myriad of terraces for sitting and soaking up the stunning views. Total bliss! 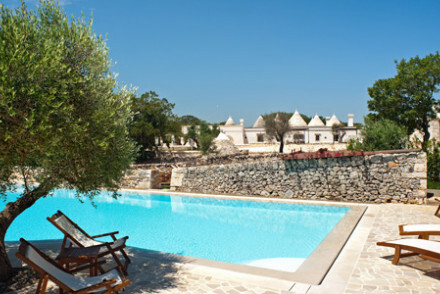 An immaculately converted Masseria providing the ultimate in laid-back luxury. Airy rooms and suites feature large floor to ceiling windows, exposed stone walls and delicate cast iron beds. Sample the best of Puglian cuisine with much of the produce coming from the kitchen garden. Total bliss. Romantic Break - Privacy, tranquility and al fresco baths designed for two. Total relaxation - A secluded abode ideal for lazy days under the sun. 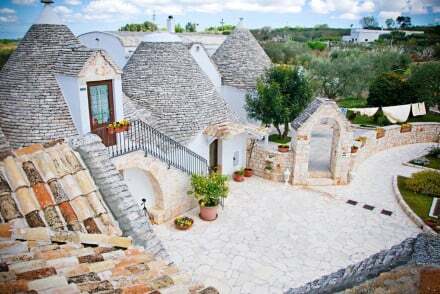 Sights nearby - Visit the trulli houses in the UNESCO heritage Alberobello. The towns of Ostuni, Gallipoli & Martina Franca are nearby. Cooking classes - Offered in spring & autumn, specialising in Cucina Povera. Enquire for dates of cooking weeks. A magnificent castle hotel in a lovely sleepy town by the sea, combining old-world elegance with contemporary sophistication. Expect restored frescoes rubbing shoulders with modern art and artisanal pieces. The food is outstanding and guests can learn some tricks at the in-house cookery school! A stunning five-star hotel, set right on the Adriatic Sea. The luxury design and magnificent location combine to create a tranquil atmosphere that is perfect for a relaxing seaside break. Enjoy sumptuous seafood and staggering sea vistas at the hotel's restaurant. The embodiment of serenity. Honeymoons - The majestic seaside setting and superb suites make it perfect for honeymooners. Beach Life - Right on the sea with exclusive access to a beach and a relaxed seaside vibe. Sights nearby - Visit the stunning historic UNESCO protected Trulli of Alberobello. This 18th-century palazzo has retained its original grandeur. The elegant rooms feature high ceilings, fireplaces and simple modern furniture with french windows overlooking the palazzo courtyard. The contemporary artworks are a nice touch. Historically rich and very central. 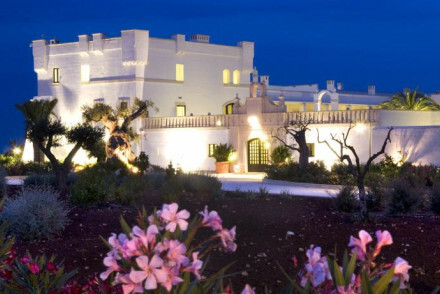 One of Puglia’s best hotels offering a luxurious spa and golf course. Rooms and fabulous suites decorated with romance - white washed walls and rich drapes, some have private gardens, jacuzzis and balconies. Fantastic selection of restaurants and stunning salt water pool. A heavenly spot. 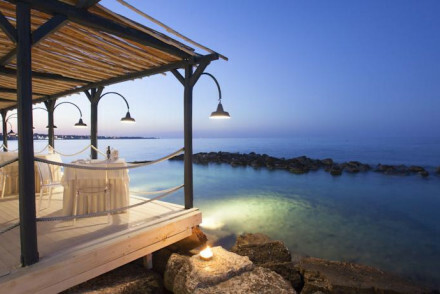 Honeymoons - A sophisticated honeymoon choice- ornate four-poster beds and panoramic views over Puglia, with fine dining and pampering spa. Active Holiday - Lovely grounds and beaches for walking, bikes for rent, tennis courts, golf course, and both indoor and outdoor pools. 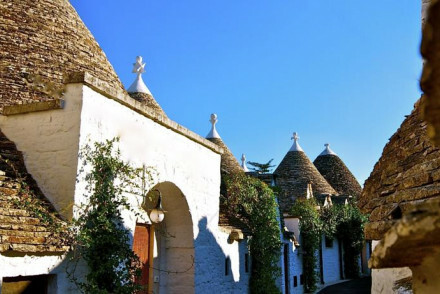 Sights nearby - Visit the nearby village of Alberobello with its fascinating domed trulli houses. Great walks - Wander the fragrant gardens or take a stroll down to the coast.